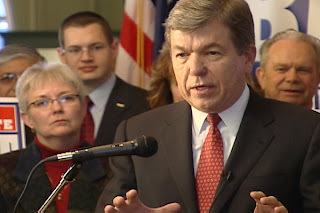 Congressman Roy Blunt joined 327 of his colleagues in a House vote to impose 90 percent taxes on bonuses at AIG and other financial firms. The House vote was 328-93. Blunt was one of 85 Republicans voting "Yes." The A.P. writes, "although a number of Republicans cast no votes against the measure at first, there was a heavy GOP migration to the yes side in the closing moments." Politico: Blunt was one of the last to vote yes, "making a difficult vote in favor of a tax increase." "He was a yes vote and the reason he was late is because he had a charitable giving press conference," said Nick Simpson, a spokesman from Blunt's Congressional office. "That lasted from about 2 to 2:30. That's why he was one of the last to vote. It didn't have anything to do with waiting for the outcome or anything like that," Simpson said. "The message sent by the House today was far from ideal but certainly needed. Failing businesses need to realize they are spending borrowed money and they must stop giving insulting taxpayer-funded bonuses to their executives. If nothing else comes from this vote today, I hope it sends the message to corporations operating with tax dollars they have an obligation to the taxpayers," said the Congressman.